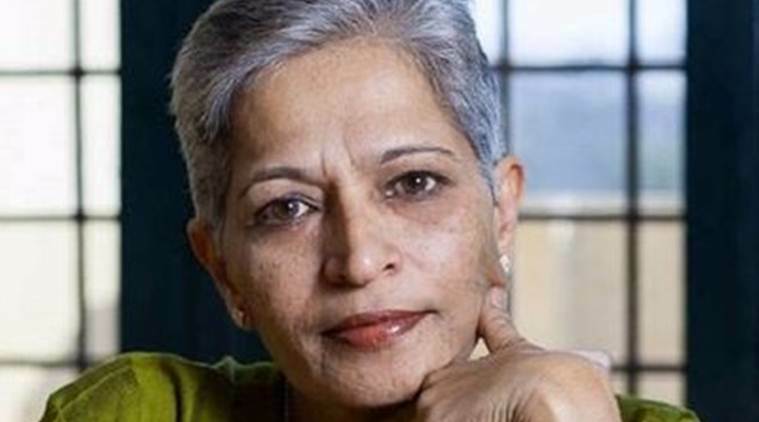 Gauri Lankesh murder: Four bullets were pumped into the editor of the Kannada weekly Lankesh Patrike at her doorstep after she had stepped out of her car and opened the gates to her home. Lankesh was known for a strident opposition to Hindutva forces. Gauri Lankesh was killed on Tuesday by unidentified assailants outside her home in Bengaluru. The cold-blooded murder of Gauri Lankesh on Tuesday has rattled many sections of society who are pouring their outrage and condolences on social media. Among those bereaving the death of the 55-year-old journalist are her four “adopted children” — Jignesh Mevani, Kanhaiya Kumar, Shehla Rashid and Umar Khalid. Dalit activist Mevani said Lankesh’s murder marked “a black day for Indian democracy.” In a series of tweets, Mevani said the killing had established that this country has become “unbearable.” In his Facebook post, Mevani added Lankesh considered him, Kanhaiya, Umar Khalid and Shehla Rashid as her children. “I stayed at her place just few days ago, around 21st and 22nd August. Me and Kanhaiya and Umar and Shehla were like her children. She would relentlessly write against Hindutva forces. She paid the price for being fearless and doing every bit to fight against Sangh and BJP. I m completely speechless,” the post read. Read | Who is Gauri Lankesh? Recalling the time spent with the slain journalist, Mevani blamed the “fascist forces” for her death. “This fascist forces will kill each and every voice of dissent..they will turn this country into a hell. I can’t believe this….She would always tell people that jignesh is my good son and Kanhaiya is my bad son. She would love both of us equally,” he added. 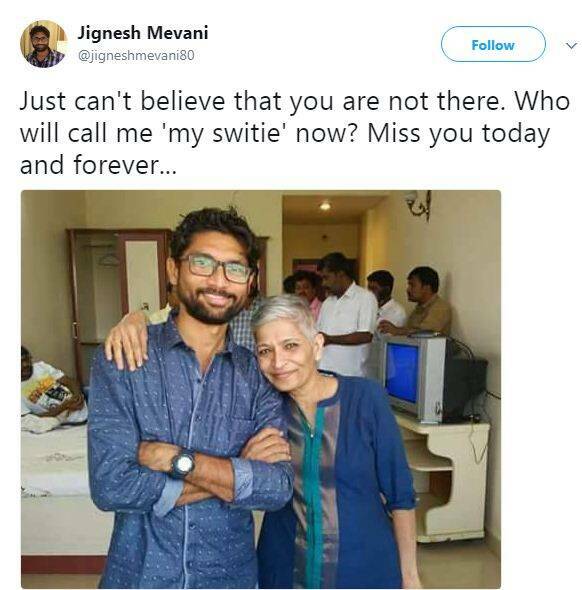 Gauri Lankesh with Dalit activist Jignesh Mevani. Taking to his Twitter account, former JNUSU president Kanhaiya Kumar shared a photograph of himself with the Lankesh Patrike editor and said he was shocked at the killing. “Deeply shocked and saddened at the cowardly murder of #GauriLakesh! She was like a mother to me. She will always be alive in my heart,” he wrote. The student-activist added that Lankesh taught him to “speak truth to power”. “She was fearless in her fight against hate. We resolve to carry on her struggle,” Kanhaiya said. Student leader Umar Khalid, another “adopted” children of Lankesh, said “bullets” could not “silence your ideas.” “To me, she was more than just a journalist. She was a strong supporter of the JNU movement, a friend and she used to call me her son – one of the four she has adopted as she would say (Me, Anirban, Kanhaiya and Jignesh Mewani). Rest in Power Friend, Comrade, Mother,” wrote Umar Khalid.